For some people, my ideas about furniture design may be a little bit old-fashioned. I do believe that chairs and tables and other pieces should be visually appealing, decorative if used in the right environment. But I'm impatient when “decorative" undermines function. A chair is for sitting comfortably on or in; a dining table shouldn't bruise your knees or fill them with splinters from badly placed legs; and a coffee table should be tall enough that you don't need a chiropractor after bending to retrieve your Chardonnay. If it flunks the "usable" test, it may sometimes qualify as art, I suppose, but I'd be loathe to call it good furniture. From Elegant to Flamboyant . . . Your Choice! This design is our most elegant ... and versatile. 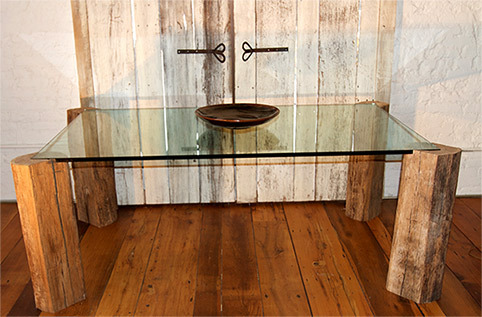 Cut from antique log cabin logs, the legs can also be shorter for coffee tables, or as here, for dining height for almost any size table. 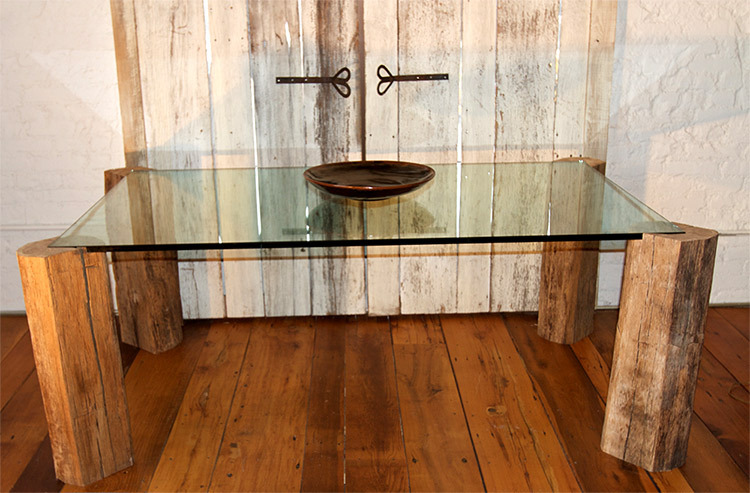 The glass top pictured is 3/4" thick and inset flush with the leg tops for a table height of 29". Legs of the same design will soon support a wonderfully grained walnut top for a dining table. That one will be 8 ½' long x 42" wide x 1 ½" thick, but the top will rise 3/4" above the log leg tops. Positively flamboyant.